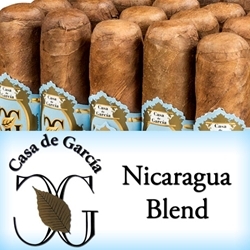 Offered as a more full-bodied version of the original Casa de Garcia line, the Casa de Garcia Nicaraguan Blend is a high-quality hand-rolled premium cigar line, made up with delicious combinations of Nicaraguan, Colombian and Connecticut Broadleaf fillers and binders, then rolled up perfectly inside a Nicaraguan Habana 2000 wrapper. Every Casa de Garcia Nicaraguan premium cigar delivers a robust medium to full-bodied experience with notes of leather, coffee and cedar. Stock up your humidors with Casa de Garcia Nicaraguan premium cigars. We’ve made it easy and affordable to buy these hand-rolled cigars online. A variety of sizes and flavors are listed below at our discount online cigar store. Each of these styles are in stock and available today at a low affordable price! Call us for more details!